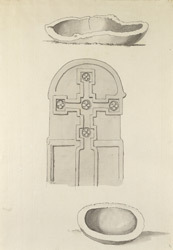 These are objects from St Paul's Church at Jarrow, Northumberland. In the 7th and 8th century, there was a Anglo Saxon monastery here in Jarrow. Part of the old monastic basilica, now forms the chancel of the present parish church. These objects may therefore be from the Anglo-Saxon period. Samuel Grimm was interested in recording objects of antiquity or curiosity on his sketching tours.